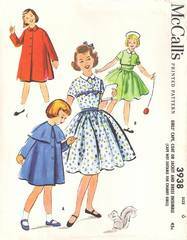 Original vintage McCall's sewing pattern 3938 from 1956. Flared, front button coat with optional small collar may be worn with or without separate cape. Coat and cape may be lined, or not. Short jacket has front button closing, small collar and short cuffed sleeves. Dress with full gathered skirt has three button closing on front bodice and side zipper. Pattern is complete. The pieces have been neatly cut. Envelope and contents are all in excellent, well preserved condition.